People have long grown mustard and cress on wet flannel to harvest for salad. Like these sprouts, microgreens are young plants, no more than a week or so old, usually with only their first seed leaves developed. The leaves and stems are harvested and served in a mixed salad. Unlike alfalfa and bean sprouts the roots aren’t eaten, not least because microgreens are usually grown in soil. A very wide variety is available, not just common salad plants such as arugula, lettuce and celery, but also red beet, cabbage, basil, endive, purslane, rapini (the edible leaves of an immature white turnip), dill, sorrel, and many others. 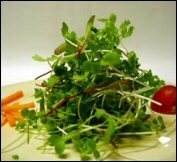 Nor are microgreens always vegetables: some are flower plants such as chrysanthemums. Part of the appeal is that the salad is often as fresh as can be, with the plants being harvested moments before they’re served. Supporters claim their flavour is often more intense than other salads or the mature plants and that they contain health-giving minerals. This puts them into the class of functional foods or nutraceuticals. The oldest example of the word I can find is from 1998. It turns up most often in connection with the restaurant trade, inevitably so because of the way the plants are grown and harvested, though some supermarkets are looking at including them in pre-packed salads. Another term sometimes used is microherbs, though this is a misnomer because the choice is much wider than just herb plants. We had different types of microgreens that needed to be layered in a specific order on the fish, so that the different colors would show. Last modified: 20 May 2006.